Looking for a wonderfully fresh cranberry salad for your holiday gatherings? This is the one - raves guaranteed. Drain pineapple, reserving juice. Add enough water to reserved juice to measure 1 cup; pour into medium saucepan. Add cranberries, dry jelly powder, sugar and pineapple; mix well. Bring to boil, stirring frequently. Reduce heat to medium; cook 3 to 5 min. or until cranberries are softened, stirring occasionally. Remove from heat; stir in nuts. Cool 30 min. 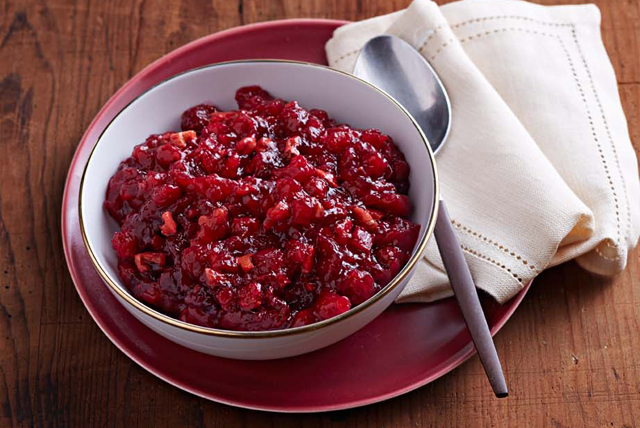 Spoon cranberry relish into small bowl. Refrigerate 6 hours or until firm. Stir before serving. Prepare using Jell-O Cranberry Jelly Powder. Using a chef's knife and holding the tip end down on the cutting board, cut back and forth across the nuts until they are chopped to the desired size. Look for bags containing brightly coloured cranberries. Store in a plastic bag in the refrigerator for up to 1 month. Or, place in a freezer-weight plastic bag and freeze up to 1 year. Discard any berries that are soft, discoloured or shriveled.